Two years ago, I tasted the famous Vietnamese-style garlic noodles featured at Crustacean in San Francisco (also served at Thanh Long and other An family restaurants). I still think about them often. 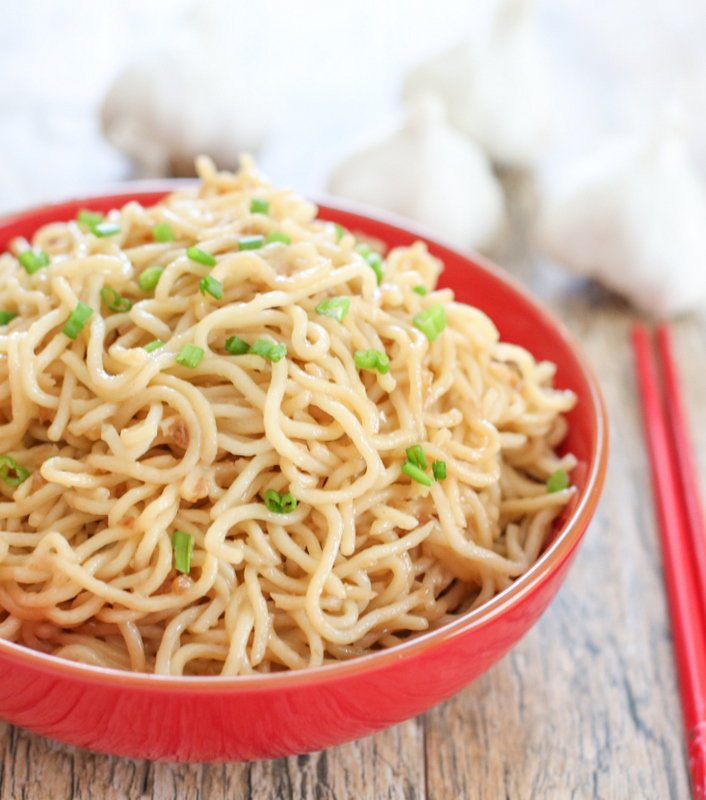 Garlicky, buttery, they are some of the best noodles I’ve ever eaten. Recently, I attempted to recreate the recipe. It’s fairly simple, with just a few basic ingredients. The end result is very similar to the dish I remember. One new thing I learned about myself while taking pictures of this dish: I cannot for the life of me, pick noodles up with chopsticks using my left hand. I grew up using chopsticks (I’m right-handed), and I can clumsily hold a fork and spoon with my left hand, and even scribble a little writing with my left hand. But trying to use chopsticks with my left hand was impossible. Since I use my right hand to hold my camera, I had to attempt to use my left hand to hold the noodles. But it just wasn’t happening. I even tried picking up the noodles first with my right hand and then switching to my left, but the noodles would sadly slide off before I could even take a picture. I finally somehow managed one decent shot. I know this dish doesn’t look like much (and it’s not even supposed to have scallion, buts I wanted a little color), but the sauce really hits all the taste elements, especially umami. The aroma is also intoxicating. The house smelled amazing after I made this and again after we reheated the leftovers. 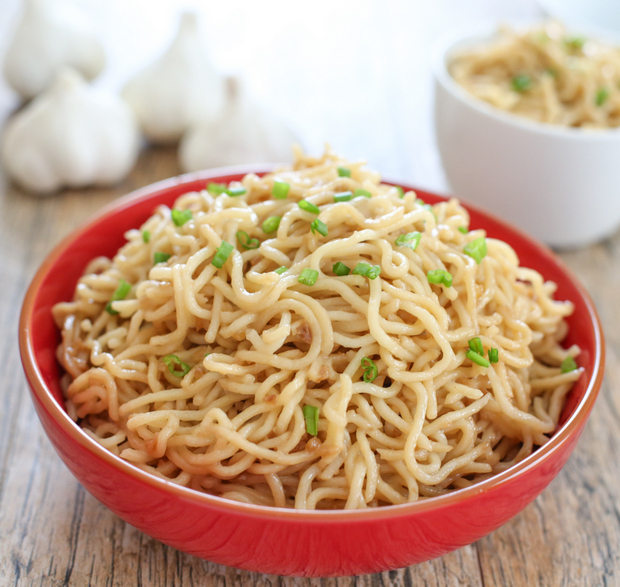 The two main components, of course, are butter and garlic, which is why I think of this as garlic butter noodles rather than just garlic noodles. 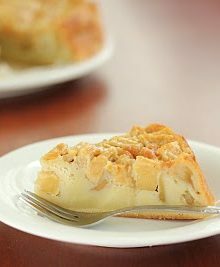 While this is definitely not a recipe to be eaten often, it does make for an indulgent meal. I’m so excited to be able to recreate this dish! I once had the famous Vietnamese-style garlic noodles featured at Crustacean in San Francisco and they were some of the best noodles I've ever eaten. I've since started making them at home and my version is very similar to the one I had at the restaurant. They are delicious! 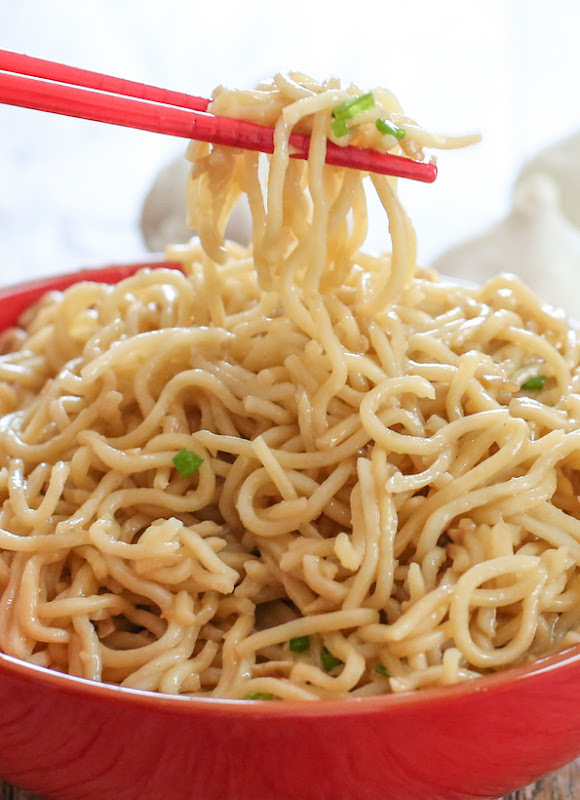 Boil egg noodles in a pot until they are just cooked and still al dente. Drain out water and set noodles aside. In a small saucepan, add butter and heat on low heat until completely melted and it begins to bubble. Add garlic and gently stir, cooking a few minutes in the butter mixture until the aroma of the garlic is brought out (I stirred on low boiling heat for about 2-3 minutes). Careful to not let the garlic burn or brown. Add in remaining ingredients, except cheese, and stir until everything is thoroughly combined. Turn off heat. Transfer noodles to a large bowl. 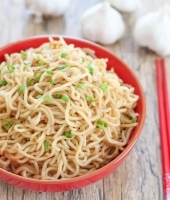 Pour in garlic sauce and toss noodles in sauce. If using, add in cheese and toss again. (As Reader Lorri in the comments pointed out, I don't actually recall Parmesan in the one I tried at the restaurant but several recipes I came across use it. 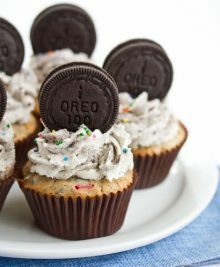 It certainly doesn't hurt the recipe, but you can go either way and it still tastes good.) If desired, top with fresh chopped scallions. Serve immediately. I am going to make this. Looks good. I’ve eaten the garlic noodles and.. I don’t recall parmesan on them. Is this a different noodle dish on the menu? Or is it *the* garlic noodle dish? Looks yummy. I’ll certainly try to make it for dinner tonight. it’s very buttery, but very good! I could eat this every day and be perfectly happy. WOW!!! I could too! It’s so delicious! I can’t wait to make this. I just need to buy a new oyster sauce. Seafood City here I come! Any particular brand of egg noodles that you recommend for this dish? Hmm, not really. I just buy the fresh ones, but no particular brand–just whatever is cheapest. And you can choose if you want thicker or thinner ones. 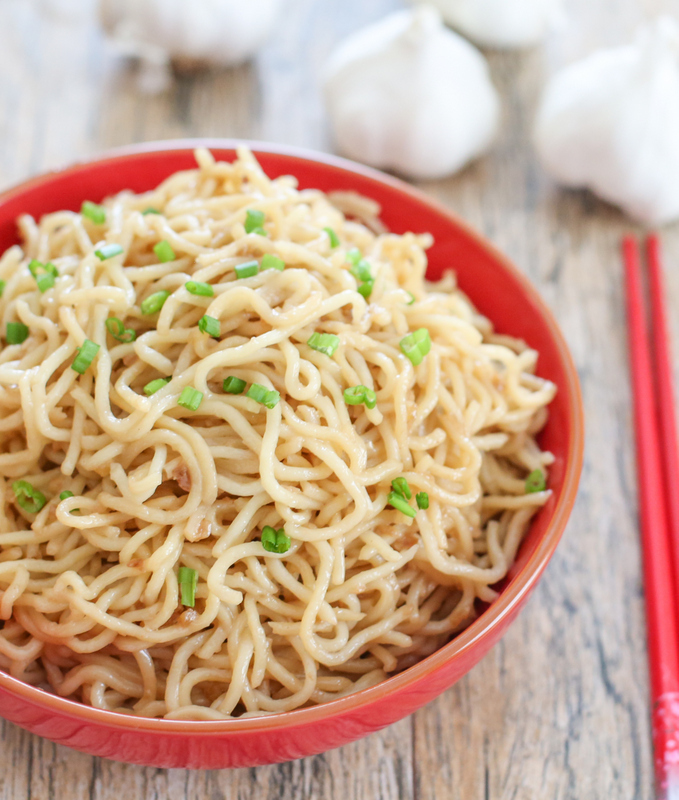 Craving a massive bowlful of these garlic butter noodles right now. Delicious dishes like this are my weakness! The garlic noodles with crab from Thanh Long is my boyfriend’s FAVORITE dish. I am definitely trying out this recipe. I remember attempting to do this in my early cooking days and it was subpar at best. Thanks! i hope this one works out for you! I tried this recipe this evening (without the parmesan cheese) and it was so delicious my whole family of picky eaters loved it. Thank you! Is it okay if I substitute it for Shanghai noodles? Where can I find the noodles? Check Asian supermarkets in the fridge aisles! Can you use spaghetti instead of egg noodles? I don’t have a particular brand I use, but I recommend you use fresh egg noodles rather than the dry ones. I get mine at Ranch 99, in the refrigerated section near fresh tofu they have bags of fresh noodles from various local vendors. i dont have unsalted butter just salted and margarine, would it be too salty of i use one of those two? 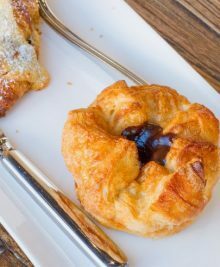 You can try with salted, but you may need to cut down on some of the other ingredients that add salt to the recipe. I imagine the parmesean would just add the umami kick since it is high in natural MSG. This sounds delicious! Does the dish hold well over to the next day? I’d like to make a large batch the night before and reheat for a potluck the next day. 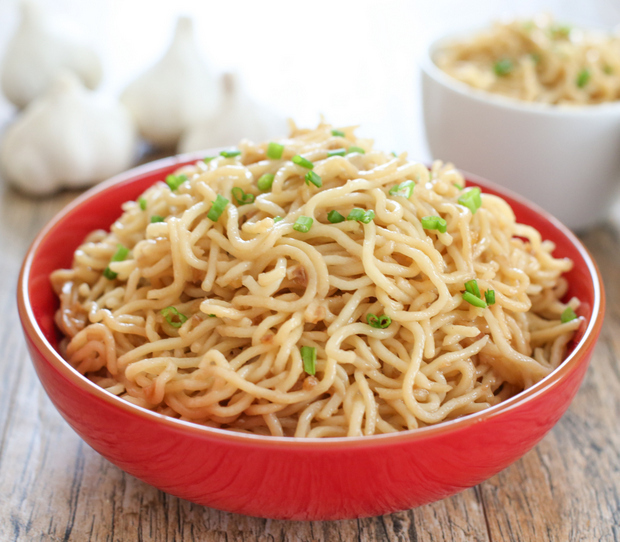 I remember a Worcestershire-y taste with the Thanh Long Garlic Noodles. Could it possibly have some? having this garlic noodle dish for me while holidaying in San Francisco was LIFE-CHANGING.